The summer holidays seem to have gone by in a bit of blur. We have managed to fit a fair amount in, and it’s been lovely to have Ed around now he is a teacher and gets the summer off. The children go back next week, and Find Me a Gift very kindly sent over some of their back to school essentials to help prepare us all for the start of the new school year. 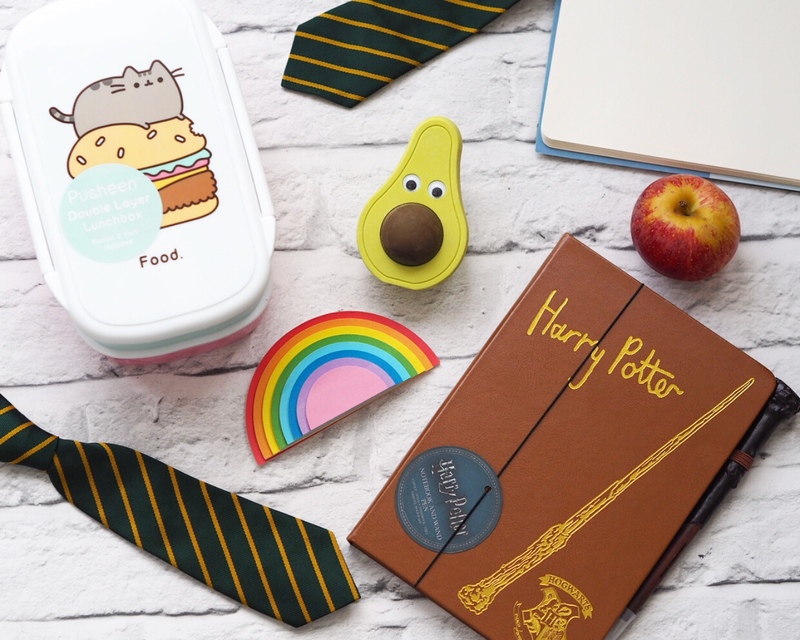 The Pusheen lunchbox is absolutely adorable and so practical too, with its dual layer providing plenty of storage space for snacks and sandwiches for a packed lunch. It even comes with its own spoon and fork! I am tempted to keep this for myself as it would be brilliant to take along on days out with Benjamin. The pastel colours are totally cute too. Since Cameron has been able to read confidently, he has been obsessed with the Harry Potter books and a trip to the World of Harry Potter last summer made him into a proper fan. He is over the moon with this themed notebook and pen set, perfect for writing down homework and practising his handwriting and spellings in. The paper is really good quality. This would make a brilliant gift once all those school birthday parties start back up again as well! I must admit I laughed a little when I saw this avocado eraser, but as well as being a novelty item, it’s actually useful to have to hand. As well as being able to rub out any mistakes, the stone inside is actually a removable pencil sharpener! Carly absolutely loved how the rubber’s googly eyes made it look just like a little creature, and she has happily packed him into her school bag. Find Me a Gift wouldn’t have been the first place I would have looked for back to school essentials, but I’m impressed with the range of products they have on offer and would recommend a look if you fancy something a little different for your kids this term. We were sent the items mentioned for inclusion in this post, however all words and images are my own.